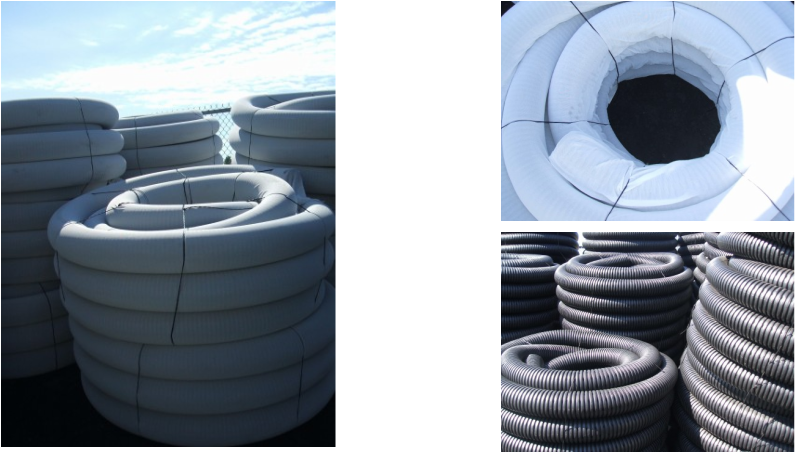 Drain Tile - cfm - Wisconsin supplier of Erosion Control Products, Straw Blankets, Geotextiles, Silt Fence, Drain Tile, Polymer, Silt Sock,Gabions, and more! Drain tile is used at the base of a building foundation to carry away groundwater. A high-strength plastic corrugated tubing that is virtually impervious to chemicals, corrosion, abrasions, rust, rotting and breakdown during use. Its light weight and flexibility cut installation time and eliminate common installation breakage. Tubing is available in non-perforated, perforated and non-perforated with sock. We have 4” and 6” diameter tubing in stock and offer a complete line of fittings, reducers and adapters. Let us know if your project requires a different size and we’ll work to get it for you.